Stephen L. Nichols, O.D., specializes in comprehensive family eye care, contact lenses, and the treatment and management of ocular disease. Dr. Nichols received his undergraduate degree from the University of Kansas. He graduated from optometry school at the Illinois College of Optometry in Chicago where he was awarded the Council on Ethics Professionalism Award. He also completed a residency in primary care and ocular disease. 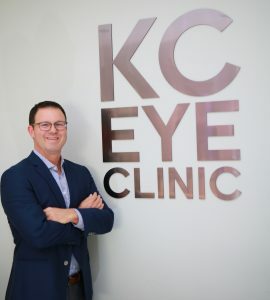 He was an assistant professor at the Illinois College of Optometry and a clinical associate at the University of Chicago Department of Ophthalmology and Visual Sciences before entering full-time private practice. Dr. Nichols enjoys spending his free time coaching his kids in youth sports, cheering for the Jayhawks, Chiefs and Royals, and skiing and playing tennis.